1. Fish Balls (deep dried fish paste) - this is best eaten when newly cooked and still hot, dipped in a special kind of sweet or spicy sauce. 2. Turon (sweet banana spring roll) - it is highly recommended that the "saba" kind of bananas (called "cardava" in English) are already ripe before cooking. Brown sugar is then melted in the pan with oil. 3. Kwek-Kwek (deep fried quail eggs) - it is best eaten when newly cooked and still hot because the orange colored flour is still a little crispy. The sauce for this is a special kind of sweet chili sauce. Some put a little vinegar to have a little sour taste. 4. Kikiam (deep fried ground pork & vegetables) - Kikiam comes in different types and forms. You can try all. The sauce for this is the same as that for the fish balls. 5. 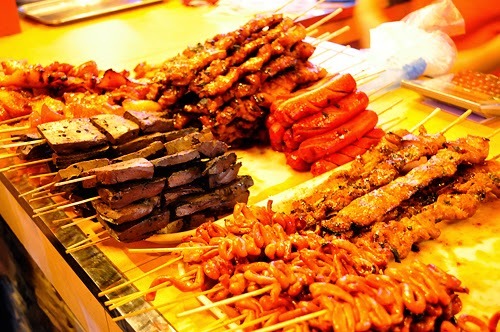 Isaw (beef, pork, or chicken intestine) - best eaten hot or not. The best sauce for this is spicy vinegar.